After a bit of a struggle, the program now lets users plot multiple custom addresses to a map. Each point can have a custom symbol, and there is a tool that allows the user to track and delete points that have been geocoded and added. (It turns out that adding and deleting individual geocoded points is a little tricky to do programmatically, but after hitting my head against the wall a few times over the week, several posts on the ESRI developer board, and a bit of good luck, the system now works.) I've also added functionality that allows users to turn labels on or off for each layer included, and at this point, I'm adding the rest of the layers. I may have to create a few shapefiles myself, as some of the data here seems a little dated (CPS schools, for instance). After these layers are in place, I want polish up the zoom functionality. Still hoping to have something usable by the time I begin student teaching in late March. Ok... this week has been full-on trouble shooting and learning how to make the code behind the software's engine do what I need it to do. I have programmed with Visual Basic in the past, so I'm comfortable with the VBA editor that comes with ArcGIS. On the other hand, the object model for ArcGIS is humongous! I've had success in the past using the object model, but it's always an adventure, and my success is owed entirely to the many support/help resources I've found. The fact is that many people have published their code online, so I haven't had to invent many wheels so far. I'd like to take a second and share my sources, in case anyone out there is interested in coding ArcObjects but just starting out. And of course, any of you veterans who know of more/better sources, please send em my way. First, I should mention that I do use my trusty copy of Getting To Know ArcObjects by Robert Burke a lot. But not nearly as much as online sources such as ArcObjects Online and The ESRI Developer Network, each of which offer a lot of documentation and code samples. But the ESRI User Forums is the goldmine. Usually my first stop - highly recommended and helpful. So, what have I accomplished so far (with the help of these resources)? For starters, I have learned how to zoom to the boundary of a polygon, such as a neighborhood or a the boundary of zip code. The volunteers here might want to make a map of the Albany Park neighborhood. They can do this now with the click of a mouse, thanks to code which came largely from the Burke book. In fact, refreshing the map layout is more complicated - in general - than I had anticipated. A guy in India on the ESRI boards helped me troubleshoot my code when I was having a hard time accessing and refreshing the legend. (Thanks, Vijay!) Maybe this technique will shine light on why my geocoded point won't refresh. I'll get that fixed this coming week. I have also learned how to access layers in the Table of Contents (toc), and how to toggle them on and off. Again, refreshing the toc is separate from refreshing the map... and then refreshing the legend - all of which have to occur when a layer is toggled on or off. But now that I can do all of this, adding the layers Dan needs (hospitals, schools, teacher/mentor program locations, etc. ), and attaching them to the interface will be tedious but straight-forward. Lastly, I should mention that a guy who lurks on our yahoo group TutorMentor_GIS_Project works for the city of Chicago, and contacted me with a donation of code that allows me to export map layouts to .pdf ... thanks! Thoughts and prayers to everyone who lost their home in this week's fire at Cabrini Green. Heartbreaking story. Cabrini Connections artists present their work in a gallery this weekend! Oh while I have you today.... If you're on the Near North Side this weekend, and want to check out some of the amazing artwork the kids here at Cabrini Connections made, the pieces will be displayed until the end of this weekend at Pallette and Chisel on 1012 N. Dearborn (Don't think about buying any of it though - it all sold already!) Some news on the event here. And here. I think you'll be amazed. Some of what I've seen is stunning. And if you can't make it but want to see a few pieces online (and read a few artist bios), there is some of that at the Cabrini Connections website. Also, a few of the kids (mentioned in an earlier post) spent years working on a documentary called Cabrini Green:Times of Change, detailing the gentrification of their Cabrini neighborhood. The film was premiered yesterday, and will be for sale beginning next week. Buy a copy to support these fine artists, and to learn a little more about the history of Cabrini Green. ($20 each, which includes mailing/$10 if you pick up copies at Cabrini Connections). Just email tutormentor2@earthlink.net. I'm heading over to the gallery right now to give everything one last look. Excited to report that my first mapping project is in motion and my first deadline – mid-March – is fast approaching! 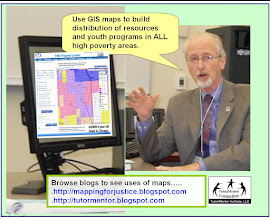 Basically, my goal is to program a custom interface with which Dan, other volunteers, or perhaps even students can create maps – using ArcGIS – quickly and on the fly. 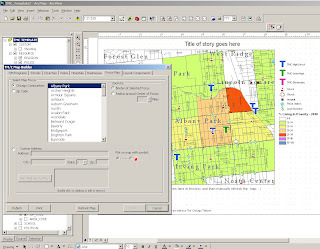 ArcGIS (the mapping software) is pretty complicated and takes some training to use. The problem is that Cabrini Connections works largely through the efforts of volunteers and part-timers and there simply isn’t the budget to have a technician like myself here full time. No one else knows how to use the software very well, so I want to give them a simple and standard Windows tool that will help them be map-makers when I’m not here. This has to be "as done as possible" before I begin student teaching late March. Why does Cabrini Connections need maps again? One of the big goals here is to raise community awareness about issues of social justice. But a larger goal is motivating people to join together to work for solutions. Everybody wants to see an end to poverty and crime and human suffering, right? Everybody wants safer neighborhoods, no? (Well I guess this is an assumption, but I’m betting the vast majority of people would do something if they could.) Cabrini Connections gives ordinary people an opportunity to do something. Like most tutor/mentor programs, Cabrini Connections pair students with volunteers like you and me… to provide mentorship for kids who are being “left behind” by underfunded schools and underinformed community, government, and business leaders. So this thing about raising awareness in folks who might be willing to work for a solution... this is one situation where maps can come into play. Let’s take an example: Here’s an article from this week’s Chicago Tribune: 2 teens shot while waiting for bus on South Side. Ok, so what do we learn from reading this? That Englewood is a dangerous place where kids get shot on the way to school. People read the story and probably think, “That's too bad. Poor kids.” And then they turn the page. (I know I know... I just got started and I have a lot of design work to do... so cut me some slack guys! :) Any rate, you get the idea. So that’s where I am at – racing the clock to get this interface built before I leave to student teach… a custom tool that will make ArcGIS easier to use for everyone here in their efforts to help people identify problems... and then find solutions to the problems.